After working successful together on previous projects, Hiltons Electrical appointed ACA to design an ICU ward refurbishment at Northwich Park Hospital, due to changes in the model of care delivery. The existing layout was modified to accommodate an ICU Suite for 5 beds, an HDU Suite for 6 beds and 2 Isolation rooms including ancillary facilities and a new entrance area. The use of the latest technology in ceiling pendants enabled a very efficient use of the layout. ACA worked closely with clinically-oriented and design and build-based, multi-professional team members to achieve robust construction information and completion of the facilities in just three months! The driving influence of the designs was to create a healing environment with measurable improvements in the physical and psychological states of patients, staff, physicians, and visitors. • Sound absorbing ceilings and dampening flooring finishes to reduce noise levels. • Materials matt finishes to minimize glare and support infection control. • Flexible floor plan layouts to accommodate changing care practices. • Reduced staff travel distances to assist the workflow, whilst supporting the progressive model of care. 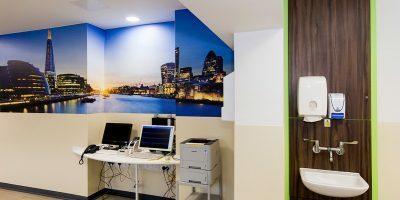 • A green colour scheme was balanced with neutral tones and timber finishes to create a relaxing environment, incorporating abundant natural light and artificial lights with changing colour tones; views of London identified the reassuring nurse bases. • The layout included an area dedicated to families’ needs to integrate families into patient care.